The structure of 1-phase asynchronous motors consists of two basic components, stator and rotor, as in 3-phase asynchronous motors. Stator is the fixed part of the motor. Stator has a stator core and field windings. In the stator of 1-phase asynchronous motors, there are usually two windings as main and auxiliary windings. Rotor is the rotating part of the motor. There is winding in the rotors of the slip-ring asynchronous motors, and short-circuited bars in the rotor of the squirrel-cage asynchronous motors. 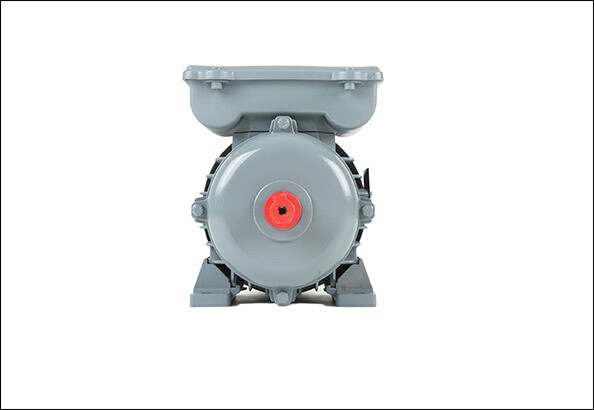 Industrial asynchronous motor product range of Volt Motor consists of squirrel-cage asynchronous motors. As is seen here, rotating field speed of a 2-pole motor will be 3000rpm and rotating field speed of a 4-pole motor will be 1500rpm. 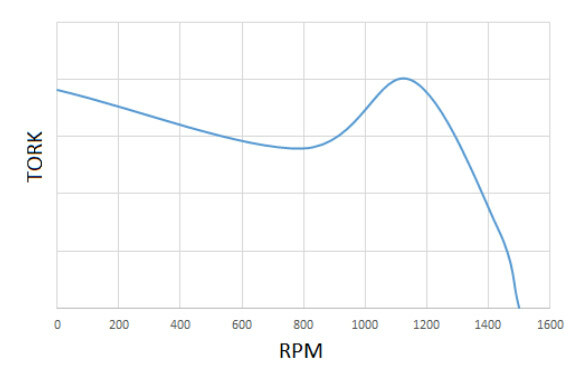 The change in rotation speed of the asynchronous motor at different loads can be seen in the torque-speed graph shown below. 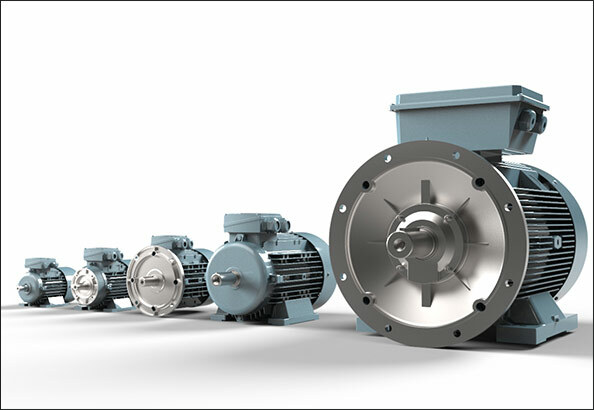 In order for generation of start-up moment in one-phase asynchronous motors, alternating currents of different phases from the main and auxiliary windings must pass. Series capacitor is connected to the auxiliary winding circuit to provide this. By this way a two-phase motor occurs. In addition to the permanent capacitor, a start-up capacitor which will be activated only during the start-up and will be deactivated with a mechanism when the start-up is completed can also be used in order to increase the motor start-up moment. 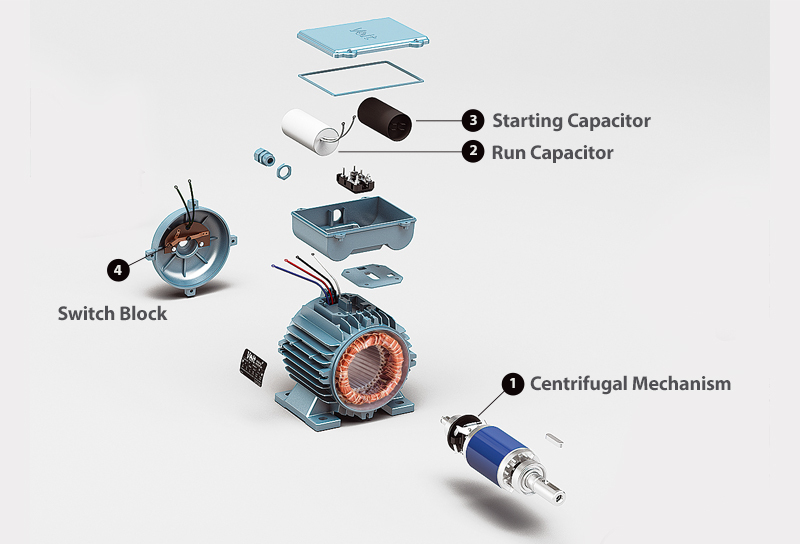 In order to deactivate the start-up capacitor, centrifugal switch is used in mono-phase products of volt motor. Permanent Circuit Capacitor Motors: These motors have only permanent circuit capacitors. The permanent circuit capacitor is active both during start-up and during operation of the motor. Start-up and Permanent Circuit Capacitor Motors: These motors also have a start-up capacitor in addition to a permanent circuit capacitor. The start-up capacitor is only activated during start-up and is deactivated by the centrifugal switch after the motor was operated. The permanent circuit capacitor is active both when the motor is started and when it is operating. can be used directly by operating from the network (DOL). Standard motors can only be used in 50Hz or only 60Hz networks. Standard motors can be operated by supplying from 220 V residential networks.